21984LF is rated 3.6 out of 5 by 27. 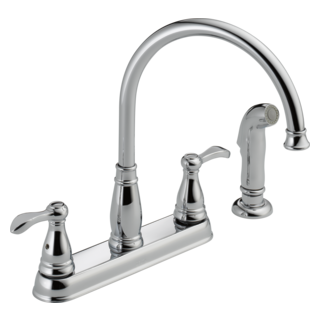 Rated 3 out of 5 by kmanley52 from Fair Faucet Faucet is stylish and installs easily, but due to its design it has a low water pressure output. Rated 2 out of 5 by Sande from Love design, not impressed with quality Installed this faucet 2.5 years ago. Sprayer stopped working in less than a year. Has been leaking from where the wand meets the base for the past year and a half. Expected this faucet to work properly for longer than it has. Very disappointed. Rated 2 out of 5 by Jamie k from Frustrated!!! The cold water handle keeps loosening up. I am your tighten it at least once a week. Wanted to just order a new one but can't seem to be able to do this. Very frustrated. Faucet is only about 2 years old. Should be this difficult!!!!! Rated 5 out of 5 by TexasHarry from Great quality, Very good design. We moved into our new home 1/1/16. We love the design and the way that this faucet operates. We had one of the tops of the handle assemblies come loose. I tightened it multiple times but it continued to come loose. I contacted Delta and they sent me a new handle assembly. I am very pleased with the service and support. Rated 5 out of 5 by Casa Johnson from super faucet I have had this faucet in my kitchen for several years now. I highly recommend it! Rated 4 out of 5 by Bald from Like its style !! Had the faucet installed a month ago or so looks good like it a lot but I have noticed a few drips after shutting off not all the time but once in awhile would not think washers are going bad already !! Rated 1 out of 5 by Poneys from Can not be used in a laminate top with an undermou This Faucet is not compatible with an undermount sink in a Laminate Countertop!!!!! The shafts are not long enough with a standard thickness laminate countertop! 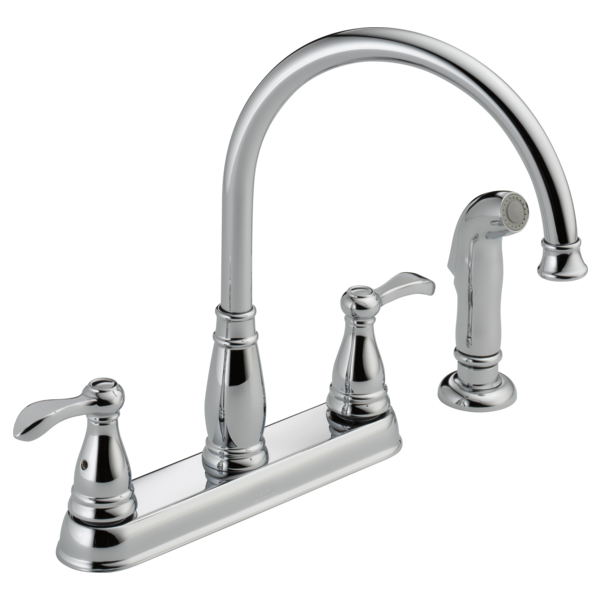 This faucet is only 11/8 standard laminate is 11/4 to 11/2. I am a countertop manufacturer. Do not buy this faucet!!!!! How do you fix sprayer that leaks when water is turned on? How do you tighten the handle? Thank you for your question. Delta Faucet model # 21984LF handles have a set screw in the side of the handle. They will need an allen wrench to tighten the handle to the cartridge. Is it possible to hook a portable dishwasher to this model? I have a Porter Two Handle Kitchen Faucet with Spray and would like to hook a portable dishwasher to it. Is this a possibility? Thanks! Hi Buford! Thanks for your question. Hooking up a portable dishwasher is not recommended for this model. The spout has uncommon external threads of 3/4&quot;. Therefore, there is not an adapter offered by Delta to accommodate a dishwasher hookup for this model. Can the sprayer be mounted on either side of the faucet? Does the sprayer need a supply line?